The original Nineties supermodels joined Donatella Versace at the Versace Milan Fashion Week show on Friday, to mark the 20th anniversary of her brother’s murder. Dressed in gold, floor-length gowns, the original supers Naomi Campbell, Claudia Schiffer, Helena Christensen, and Carla Bruni walked the runway with Donatella to the late George Michael’s Freedom. A voice announced “Gianni, this is for you,” as a curtain was drawn back to reveal the supermodels. Gianni Versace, who founded the fashion house in 1978 and is widely credited with cementing the concept of a supermodel, was shot dead on the steps of his Miami Beach mansion in 1997. The gunman Andrew Cunanan took his own life in the days following, after killing five people including the fashion designer. After her brother’s sudden death, Donatella took over his duties at the fashion empire. The soundtrack and the gang of supermodels strutting arm-in-arm referenced the 1991 Versace show, where George Michael sat in the front row.Speaking at a press conference prior to the show, Donatella said that she was “happy” that after 20 years she can “finally do this with a smile on my face,” The Guardian reported. To celebrate her brother’s work, Donatella used bold prints showcased between his 1991 and 1995 collections, including the leopard from the 1992 Animaliercollection, the 1991 collection using Andy Warhol screenprints of Marilyn Monroe, as well as the Greek baroque styles of the same year. 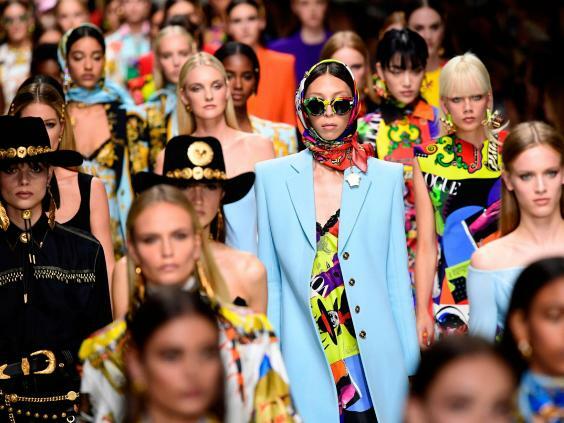 “We pay homage to not only (Gianni's) artistic genius but to who he was as a man, and above all, as my brother,” Donatella wrote in the Versace Spring/Summer 2018 collection notes, according to SkyNews.